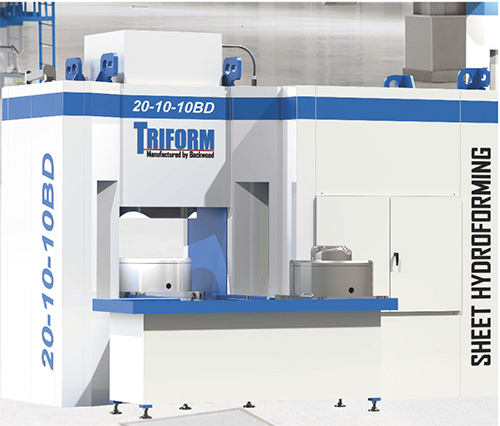 Beckwood Press Co., St. Louis, MO, has advanced its Triform sheet-hydroforming product line with the introduction of new, large deep-draw BD-series models. The new models include updates to the pressure-containment system that reportedly result in significantly improved cycle times. Also, each new press comes equipped with Triform’s standard, efficient and ergonomic tool-change system that minimizes changeover times. A cartridge-style chamber is conveyed through the rear opening of the press, presenting the blankholder and punch to the operator. An optional T-table allows the operator to stage a secondary cartridge, including the blankholder and punch. The system also allows the press to convert quickly from a deep-draw configuration to a fluid-cell configuration, for shallow forming without the need for a movable punch tool. The new BD designs are configurable, giving metalformers options for either a horizontal layout with the hydraulic power unit (HPU) positioned to the side of the forming chamber, or a vertical one, which features a crown-mounted HPU. Where floor space is a concern, the vertical configuration is significantly smaller than previous Triform models with an equivalent forming area.